Be A GREAT Role Model-even when you think no one is watching! The best thing happened yesterday morning when I dropped Max off at school! Bella-his “girlfriend” saw me in my usual gym attire and asked me….. “do you go to the gym everyday?” This is great on so many levels!!! It reminded me that kids notice EVERYTHING and that we are influencing them ALL OF THE TIME! So yes I told Bella I go every single day that I can with a big smile! Who knows, I may be one of the people that she remembers from being 6 years old, seeing that smile on my face and knew it was because I was going to the gym! I hope so! I was proud of myself for setting a good example for Max and his school friends! I have memories from when I was younger, around 12, of my Godmother, Judi, going to the Y and doing aerobics. I started to go too and remembered having so much fun! This I know for sure is my first fitness memory. That is always something I noticed and remembered about her, she LOVED the Y and still does! What a great role model for me and her 5 daughters! This is when it starts when we are little, we are shaped by our families until we grow up and get our own ideas. So, my point is think about what you are doing and who might be watching. You are shaping young minds everywhere you go and with everything that you do! Good habits NEED to be formed at a young age! Little ones deserve to be set up for success. They don’t deserve to have to try to back pedal when they get older to rid themselves of bad habits that never needed to be formed in the first place…..at least that is what I think. Mommys and daddys I know you are busy but I guarantee if you tag each other out 3 times a week for an hour each to make it to the gym you will be happier and less stressed! Exercise reduces stress and releases endorphins so give each other the gift of happiness a few times a week-an hour alone with no kids at the gym all to yourself! Your kids (and other people’s kids) will notice and they will thank you for the new you, the new awesome you! 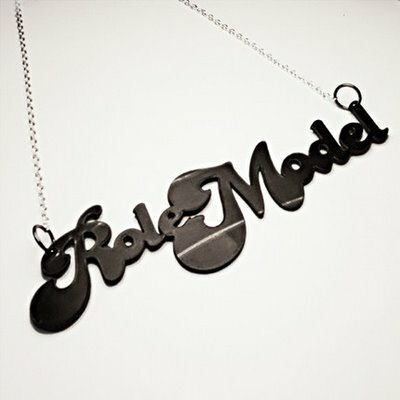 Be a GREAT ROLE MODEL & DFTBA! Sharing health is one of my favorite things to do! If people try it they may just like it and that makes me happy! Every little bit helps. 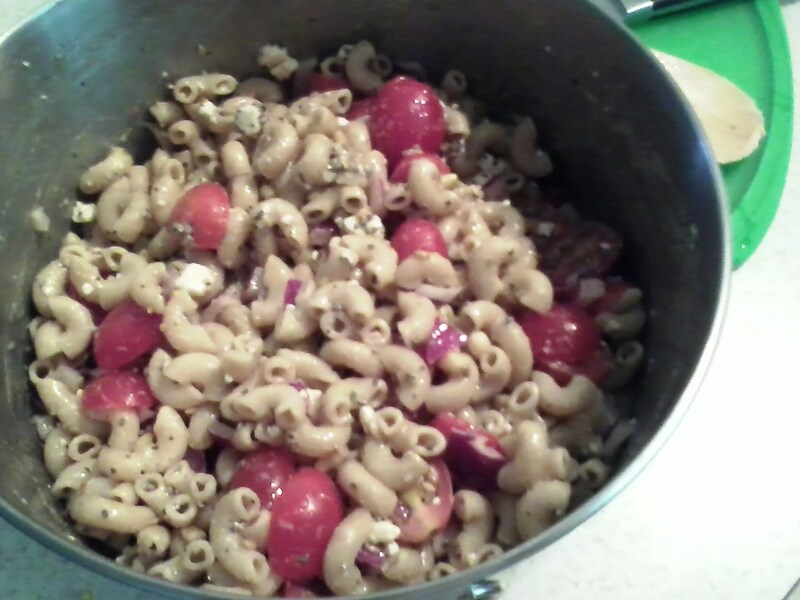 This contains whole grain elbow pasta, tomatoes, red onion, pine nuts, crumbled blue cheese, olive oil and red wine vinegar, chia, flax, (yes, I even snuck them in there too!) blk pepper and basil. That’s it. 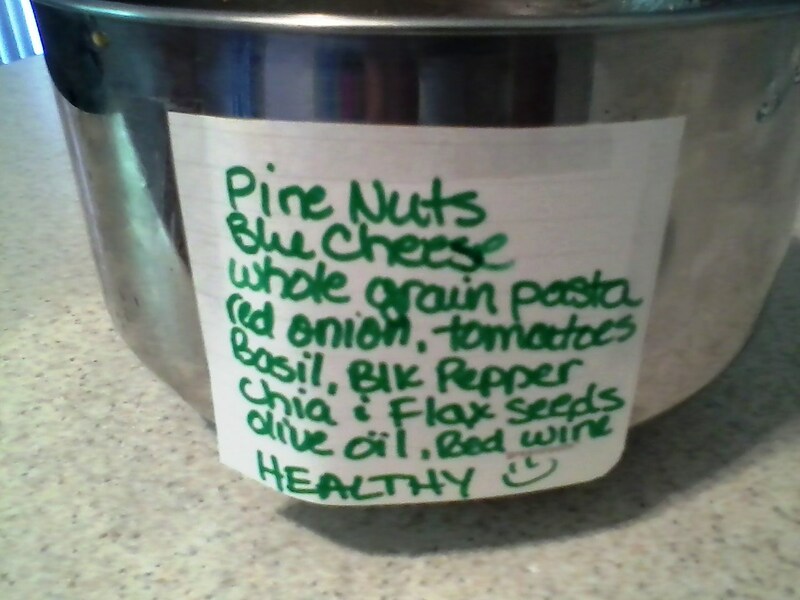 Much healthier version than grandmas unless grandma is a health nut like me! No, I’m not on crack but I am on flax! Ok, let’s talk depression and let’s be very honest and real about it. I have never been diagnosed with it but I am almost positive that I was for most of my 20’s if not some of my teens and 20’s. At one point in my marriage I was told to basically shape up, figure it out or get shipped out, in so many words. Well, we know how that story ended. (I got shipped) So, my point in sharing this is not to blame my ex-husband for not understanding that I most likely needed help (or at least some spinach smoothies with flaxseed) but to get others to understand that there are things you can do when you are faced with non-supportive “shape up or ship out” situations. I am pretty sure that from 2007 to 2010 I had prepartum (no I’m not sure if that is a real thing), partum (this either) and postpartum depression (ha)….it wasn’t that I was miserable…its just that I wasn’t me, I wasn’t the “happy and alive” that I am now. Now, people ask me believe it or not, “why and how are you so happy?” Seems silly right as we should all be striving to be this happy! We should be asking “why are you so miserable and what can I do to help?” Misery really does love company and I will not stand for it or be part of it. I believe in love, helping others and happiness. I surround myself with others that believe in the same. Surrounding yourself with those that believe in you and your dreams is so important for your happiness! I can literally run people over with my happiness now and its awesome! I want you to feel that way too! When I started adding flaxseed to my smoothies I was only doing it because I thought maybe I should be “going potty” (as my 3 yr old would say) more. Sorry if that is TMI but its true. It turns out that a little dose of flax in the am was actually setting a happy tone to each of my days, along with many other benefits! I am pretty sure I am addicted to it now because of that. How great is it to be addicted to things that make you feel great and are so good for you, like exercise and eating right! I know some of you have addictions to junk food, to alcohol, cigarettes etc……Why not try eliminating one bad habit this week and try replacing it with a good habit until all of your habits are good and you kicked the bad ones all to the curb. That is how you achieve a healthy lifestyle by forming all the right habits. Then it becomes second nature and no longer seems like a chore or a burden. 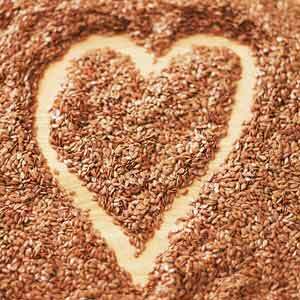 I hope this info about flax has helped some or one of you as that is my intention in sharing my stories with you. Caffeine- also a natural fat burner (Bonus!) and yes, some caffeine per day is completely fine!!! Don’t forget to be awesome friends!!! Karate chopping intimidation at the gym! So I have been hearing from some friends that “they don’t belong at a gym”….they are “intimidated by the other people there that are in better shape than them” …. (insert any other excuse, I mean reason, here) etc. Well let me tell you a secret, I was once a scared little puppy just like some of you and I want to help karate chop that intimidation for you right now. I am clumsy. I am not coordinated. I had no idea what I was doing 2 years ago when I first started. I wanted to keep to myself and I didn’t want help. I didn’t feel like I fit in there either. Now, 2 years later I could care less about who is there, what they look like, what they are wearing or what they are doing. I am there for me and for my development. I am in the zone from start to finish. I observe what others are doing so that I can try new things and see whats going on in the world of fitness but I am there with my goals to accomplish and that is that. Remember, “those people” were not born physically fit perfect specimens. They also stepped into the gym for the first time one day and needed to lose weight or get ripped, toned and killed just like you. If you dare enter the gym you will be surrounded by people with like goals which is so important in staying motivated when trying to transition yourself to a healthy lifestyle. The gym is my happy place. Exercise releases endorphins. Think about it, you are going to one of the most happy places on earth, there are endorphins flying around everywhere! Laugh at the gym. It’s a FUN place to be! Above all else, please don’t be afraid to go to the gym, to try running in the park, to try a spinning class….. to do anything. Life is too short to be scared of anything. Be bold, be brave, be yourself. Now go…karate chop your fears. You are awesome! 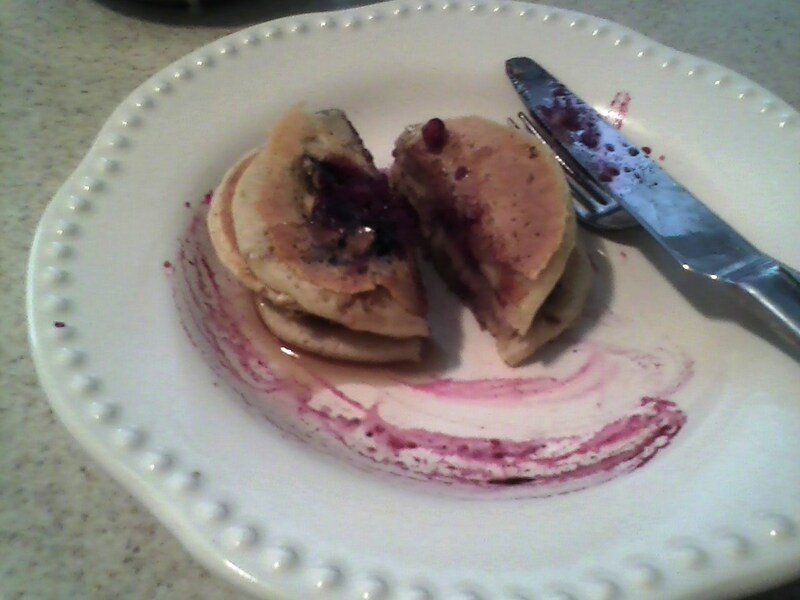 I love pancakes and just because I love to live a healthy lifestyle does not mean that I can’t have them! 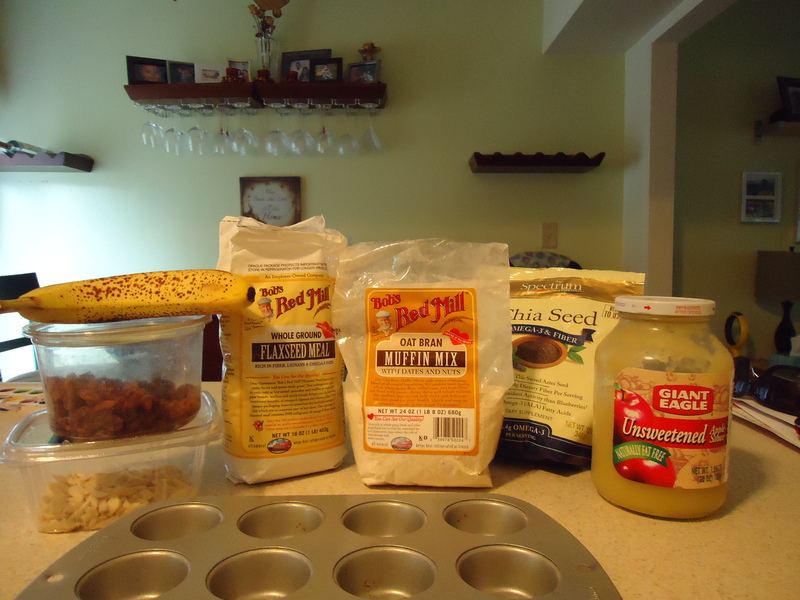 Choose your ingredients wisely and you can enjoy all your favorites in a more healthy way! Treat yourself by treating yourself right. 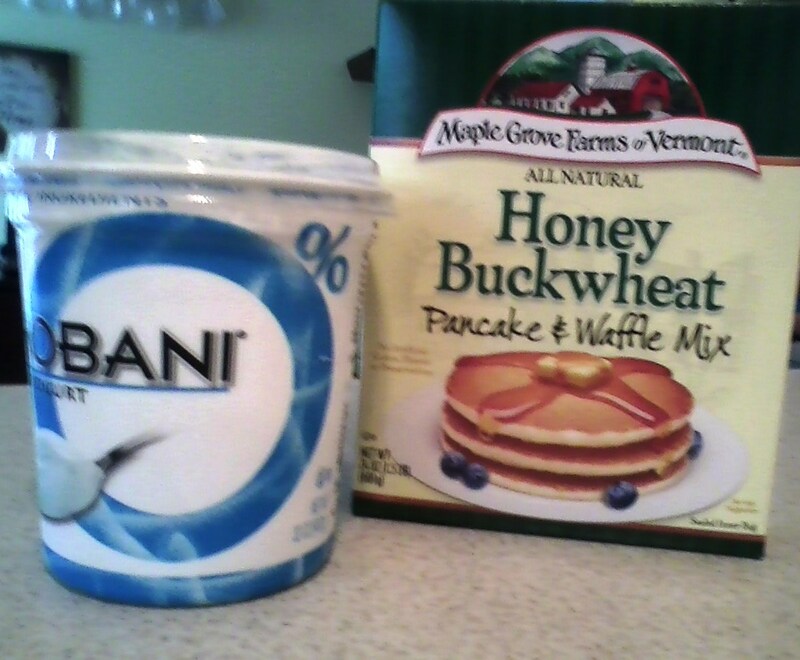 I use this pancake mix pictured because it is made of whole grains, whole wheat and is also low in sugar. Look at the nutritional facts of what you are buying. Is it made of artificial colors or flavors and preservatives? Put it down if it is and choose more wisely. 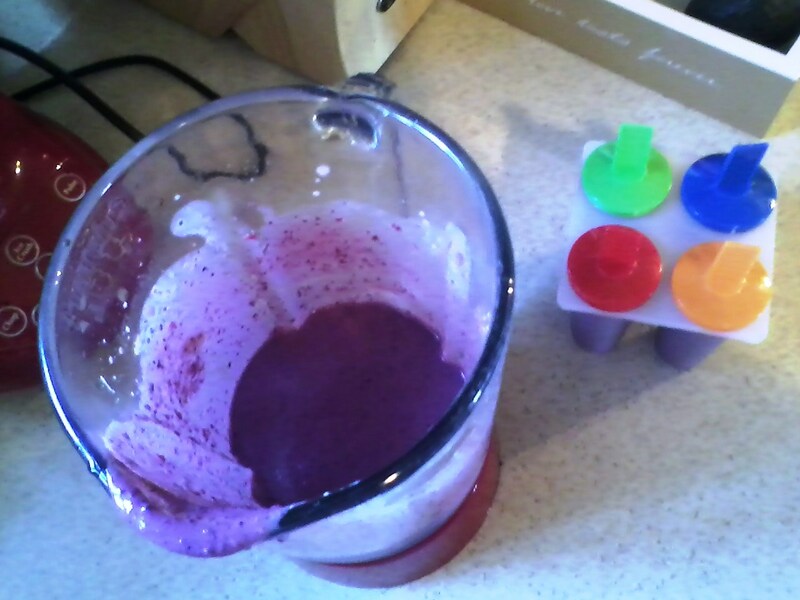 I added Greek yogurt, fresh blueberries and water to the mix. That is it. Max and I enjoyed these this morning with a little dab or two of syrup! 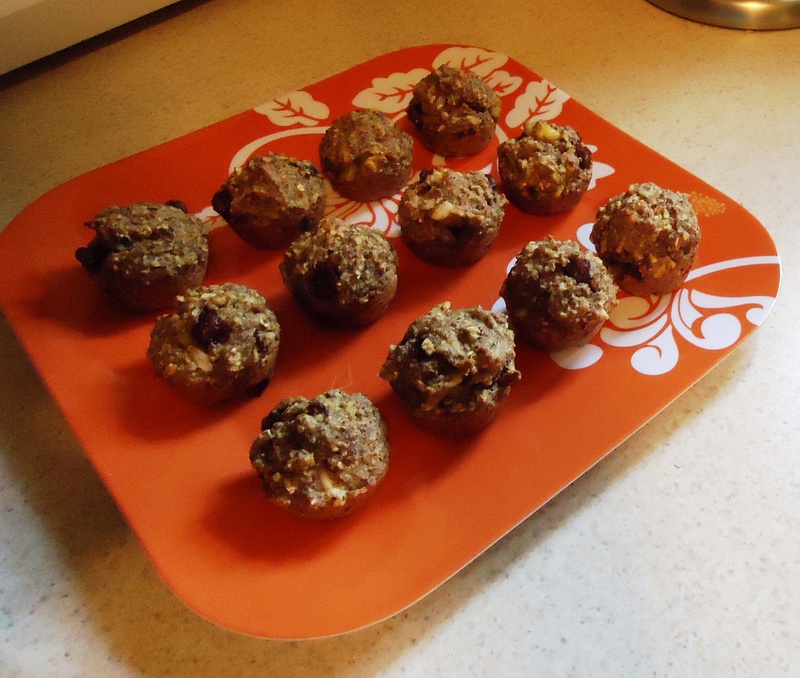 Delicious and I feel like we “treated” ourselves to a healthier version of one of our favorite breakfast foods! This is my workout from this morning! Shoulders and chest done with my first “test client” Elena-a dear friend of mine! She is letting me experiment with her in exchange for a pretty awesome day at Jimmy Buffet next week! That’s our reward for being so awesome. BGTB-Be Good Till Buffet! Ha that’s our motivation to be good, do work and get results. We are not thinking months ahead or even weeks-just a week and a half of goal setting and getting it done (we started this past Monday). Then, after Buffet we will set new goals and keep going….. Speaking of which, I have been laid off for 2 weeks now and I can honestly say that I have been to the gym, ran or both 10 out of those 14 days. I see and feel results. With extra time I have been able to concentrate more on my body and it is showing. So 2 weeks of dedication and commitment equals one happy girl! I have been more productive and motivated in these past 2 weeks than ever in my entire life. That is how you get results by being excited and committed to the cause-whatever that may be. Enthusiasm goes a long way!!! 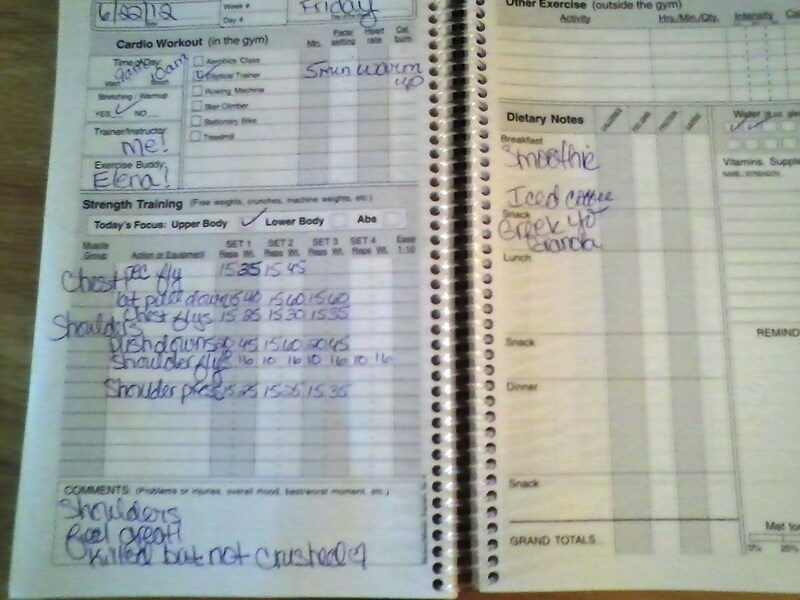 You can see from my BodyMinder what exercises we did and also what I ate and drank so far today. Don’t forget to get some protein immediately following your workout! 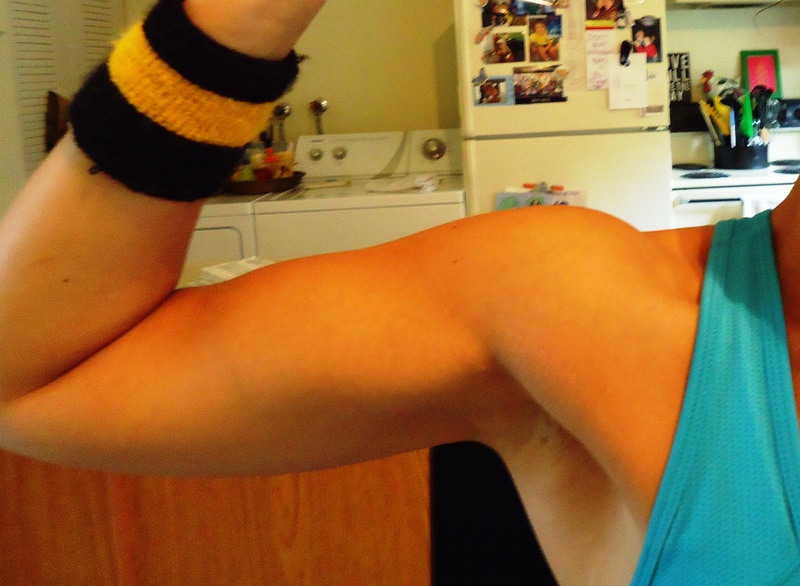 Your muscles are craving it-don’t upset them! Hmmmm….Its almost time for lunch as I write this-I’m excited! You have the plan now go kill some shoulders! Be full-full of thanks and gratitude for everything you have and are going through. Be mindful of others and how they act, who are they and what they are not. Take and absorb the traits of others that you wish to be. We are attracted to others because they have traits that we want in ourselves. Be fully aware of what you are doing at every moment. I just tucked my son into bed and as we talked I was very much in that moment. I was fully aware of that too. It was like I stepped out of myself and saw us and reminded myself to pay attention and feel the moment and enjoy it and I did. Be very grateful for all of your past experiences. People really do come in and out of your life for very good reasons. Once you realize its ok to let go and take that person and those experiences to help you keep growing-you will be a much calmer and smarter person. They are put in your life for a reason at the time and taken out at a time. It is all part of a master plan and a great one at that. You just have to believe that everything will always be ok. People can change, people can be sorry and realize what they have done in the past was wrong. I really don’t like the phrase “people don’t change”. I do believe you “can’t change people”….they have to do that on their own. We almost can’t blame each other for the way we act in particular situations because it only happened like that because of who we were in the process of realizing this concept. So my point is, don’t hold grudges, don’t put blame and hate. Just accept it for what it is now and make the best of it! Make it awesome! Love really is what makes the world go round. Once you choose love as your path I swear things get easier and easier to sail through. Just some things I’ve learned along my way….. I really could not love these 3 things more. So why not put them all on the same plate! No recipe needed. 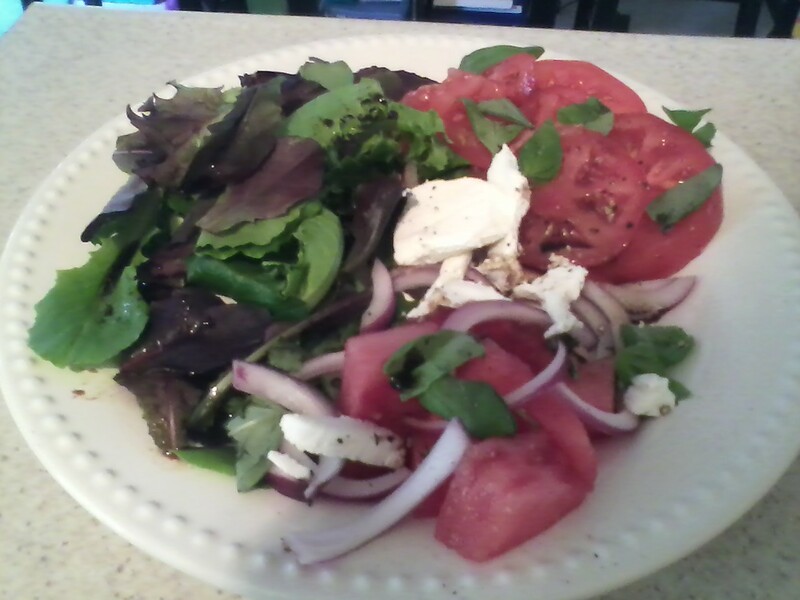 I just added red onion with balsamic/EVOO and a touch of honey and fresh basil. Look how pretty this is! If you have not tried this combo I promise you are missing out on a little slice of heaven! Packed full of important antioxidants. It is an excellent source of vitamin C and a very good source of vitamin A. Perhaps the greatest reason of all because its summer and all I do is sweat…. Watermelon is a fruit that is rich in electrolytes sodium and potassium that we lose through our perspiration.